The Taize Community is an ecumenical monastic order that invites people of different Christian faiths to worship together. They are well known for their contemplative hymns in many languages. Gracious God, I strive to follow Jesus in my living and to trust your power in my dying; I bow my head today to reflect upon the life that ended on a cross. I recognize in myself the strengths and weaknesses of Jesus’ disciples: although they loved him, they disappointed and failed him. And yet, gathering with these imperfect friends at this last meal, Jesus washed their feet in service, and then extended the bread and cup to each. Jesus called them to love one another, and invited them to share in his very life and in his acceptance of the road ahead. I am humbled, honored and inspired by the deep love Christ extended to the world, and I hear with open ears the calling to be a member of the body of Christ. Forgive me when I disappoint and fail you, and guide me back to a place of trust and faithful living. Grant me the vision to see the world as you see it, with love and compassion for each creature and all of your creation. Heavenly Father, help me to make religion a thing so beautiful that all men may be won to surrender to its power. Let me manifest in my life its sweetness and excellence, its free and ennobling spirit. Forbid that I should go up and down the world with melancholy looks and dejected visage, lest I should repel people from entering your Kingdom. Rather, may I walk in the freedom and joy of faith and with your new song in my mouth, so that all who look on me may learn to trust and to love you. And this I ask in the name and for the sake of Jesus Christ, my Savior. 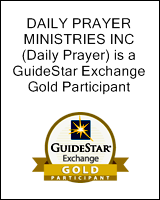 What Bible verse tells us that Jesus gave up His divinity during His human life? Although He existed in the form of God, Christ did not retain equality with God, but emptied Himself, taking the form of a bond-servant and being made in the likeness of men. Being found in appearance as a man, He humbled Himself by becoming obedient to the point of death, even death on a cross. 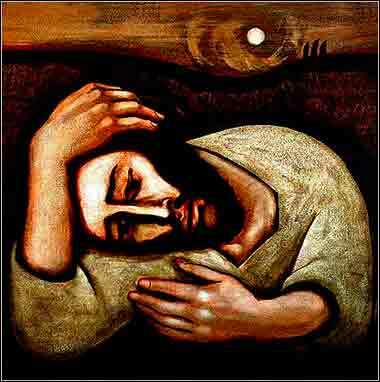 Christ in Gethsemane by Michael D. O’Brien, contemporary. Again, for the second time, he went away and prayed, “My Father, if this cannot pass unless I drink it, your will be done.” And again he came and found them sleeping, for their eyes were heavy. So, leaving them again, he went away and prayed for the third time, saying the same words again. erusalem, a crowded city on a hilltop in an arid climate, had little room for gardens. 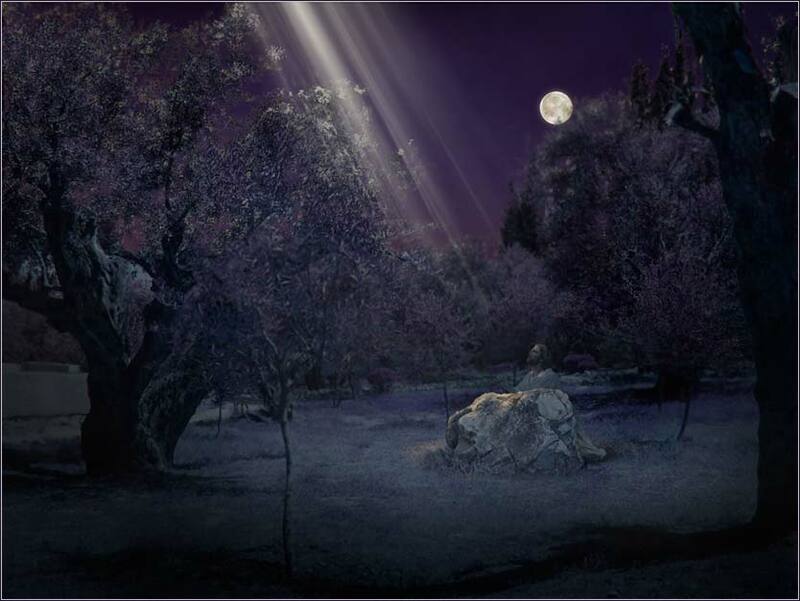 Gethsemane might have been what we would call a park, or a private enclosure opened to Jesus by a friend; for he did have friends. It formed a little stage for one of the most touching moments in human history, Jesus' last moments of peace. If one has not fully appreciated the humanity of Jesus, how much he was one of us, this scene in the dead of night — for this had to be sometime between midnight and dawn, the “dark night of the soulThis expression may sound like Shakespeare, but it was coined in a mystical poem by Saint John of the Cross, a 16th century Spanish priest. ” — readjusts our view of him. He doesn't want to die; he is thirty-three years old and healthy, and he doesn't want to die, and he especially doesn't want to die by torture and crucifixion in a few hours. Every man dies alone, to paraphrase Paschal, and Jesus' last hours remind us of it. He takes with him his three best friends, his most faithful disciples, Peter, John and James; but they are exhausted and cannot stay awake. And so he awaits his fate alone in prayer as Caiphas, with a squad of Roman soldiers and an arrest warrant, hunts him down. We see here also his greatest temptation, surely greater than he faced from Satan in the wilderness at the beginning of his ministry. But he does not cross the line from temptation to sin. When he prays that his fate might be changed and he be allowed to walk away, he never becomes disobedient to the Father's will; he does not even hint at that possibility. Here, Christ is not only our God, but our model. He is often seen as our intermediary, the link between ourselves and the unknowable and invisible Father. Hebrews calls him our “high priest” (Hebrews 4:14) and John calls him our “advocate with the Father” if we sin. (1 John 2:1) We are reminded of the prominence, in the Lord's Prayer, of the phrase “thy will be done,” an overriding desire that must inform every prayer. For the subordination of our will to that of God is a paramount lesson, for any person who would find salvation. And thus, we get a glimpse into the man Jesus, who must teach us what it means to be obedient unto death. And he was made man for this very reason: that he might fear and suffer just as we do, and yet prevail by his unblemished obedience.